In American politics, the President proposes federal budgets but it is Congress that decides federal budgets. Last winter, the President’s budget office proposed a Fiscal Year 2015 planetary budget that was better than proposals for previous years but still well below the levels needed to enact the program laid out by the science community in the Decadal Survey. Both houses of Congress have now proposed their alternative plans (although the Senate budget has not been approved by the entire body yet). How has planetary exploration faired? It’s useful to start by looking at their changes to NASA’s entire science program. 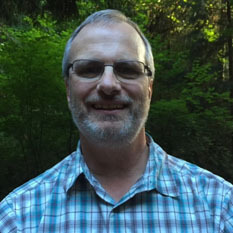 Each of the science divisions – planetary, astrophysics, heliophysics, and Earth – are operating on budgets well below what’s needed to fulfill the visions in their Decadal Surveys. However, the political parties have settled on a budget compromise that sets a limit on overall government spending. Within that limit, the Congressional bills have been fairly generous in proposing increases for NASA’s science programs in lieu of spending on other government programs. Both Congressional bills would increase funding for astrophysics, but the House favors a substantial increase for planetary exploration while the Senate proposes a modest increase for Earth science (most of which is simply the transfer of satellite programs and their funding from another government agency). 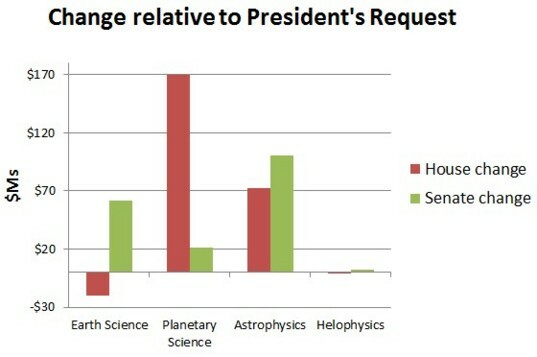 Congress' proposed changes to the President's requested 2015 funding for NASA's science programs. Both the House and the Senate bills propose to increase spending for the Mars program. The House bill would add $22.7M, a bit more than is needed to continue operating the Opportunity rover as well as all other Mars missions in progress and continue the development of the 2020 Mars rover. The Senate bill would be much more generous with an increase of $65.7M. The Senate bill specifically states that it wants to see all current Mars missions continue operating (which would require approximately $15M over the President’s request) but does not specify what the remainder of the funding would go towards. NASA could use the remaining increase for development of the 2020 Mars rover, which is on a tight budget. Both the House and the Senate bills would provide increased funding for the Discovery program with the increase targeted to enabling selection of the 14th mission in the series to occur in approximately two years. (The 12th missions, the Mars InSight geophysical rover is in development and is fully funded, and the selection process for the 13th mission is in progress.) Both Congressional bills direct that Discovery missions are to be selected every two years in accordance with the recommendations of the Decadal Survey rather than the every five years of the past decade. If the Discovery program receives funding in future years’ budgets for missions every two years, or five per decade, this is a tremendous boost to NASA’s program. Both Congressional bills state the importance of a mission to globally explore Europa, but take very different directions with recommended funding levels. The House bill would add $85.3M to the Outer Planets budget, which on top of the President’s request would provide $100M to continue preparatory design for the mission. The House bill directs NASA not to consider any Europa mission that would be substantially cheaper than the ~$2B Europa Clipper it is currently defining. This is in response to the request of the President’s budget office and NASA senior management seeking ideas for a mission that would cost approximately half as much. The House bill states that the committee that drafted its bill has not seen any “credible evidence” that a scientifically useful mission could be flown for $1B. The Senate bill cuts the Outer Planets program by $16.7M, or a little more than $15M the President requested for Europa studies. (The remaining funds would support the Cassini mission at Saturn and pay for development of US instruments on the European JUICE Jupiter-Ganymede mission.) The Senate bill gives no explanation for the cut. In fact, it states in the text that it support’s the President’s funding levels for the Planetary Science program except for increases the Discovery and Mars programs. The cut to the Outer Planets funding appears in a table, but no explanation is given. The Senate bill directs NASA to plan to use the Space Launch System (SLS) booster to launch a Europa mission, while the House directs NASA to consider using the booster. The SLS has the ability to deliver a Europa mission to Jupiter in around 2.7 years compared to a 6.4 year transit if commercial boosters are used. However an SLS launch would cost ~$1B compared to a few hundred million dollars for a commercial launch. Congress plans to fund the development and building of several SLS boosters so their cost is already covered. While the House and Senate bills both would increase net spending to develop future missions with one favoring Mars and the other Europa, the Senate bill would cause harm elsewhere. 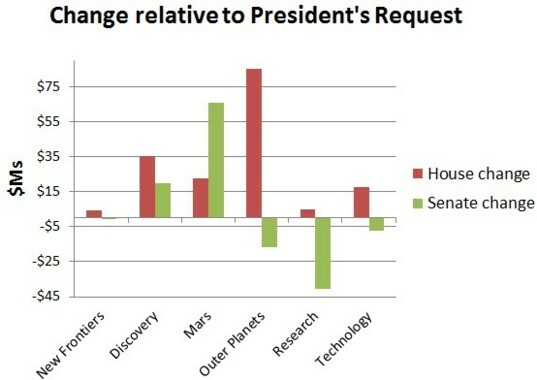 While the House bill supports small increases to the Planetary Science program’s research and technology programs, the Senate bill would impose significant cuts to these programs. Cutting the research program likely would reduce grants to scientists. At best, this would stall work to analyze data returned from NASA’s missions. At worst, this would force a number of scientists and graduate students who depend on these grants to leave the field. Eventually, the two bills will be reconciled into a single budget that will set NASA’s funding for current and future missions for 2015. From my news reading, it’s widely expected that the final reconciliation of the House and Senate budgets won’t occur until late this year following the Congressional elections in early November. This whole process seems so tiring with all parties looking at their own short term vested interests. Very encouraging that space exploration is being funded at a greater level but its sad that it appears to be just to use the SLS rocket as a make jobs program and so as not to rely on the Russians or commercial space enterprise. A sad old boys network if I've ever seen one. If Exploration is just for prestige then why even bother doing any science then? Aaron: I agree that the whole process can be pretty frustrating. It's an unavoiadable aspect of the process, unfortunately. The key for us is to stay focused and engaged through the ups and downs. It's the only way!